Women’s ‘Righina’ wool socks from Castelli. 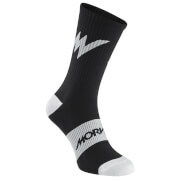 Crafted from high-quality merino wool blend in a terry knit construction for additional warmth, the cycling socks provide insulation and optimise the temperature of your feet for performance. The ‘Righina’ socks have 13cm cuffs and their sleek striped blue and white design is complete with the iconic Castelli logo. – L.R.